Eight in 10 Iowans find food labels misleading, according to the Iowa Food & Family Project’s (Iowa FFP) annual Consumer Pulse Survey conducted among households’ primary food purchasers. This, along with 55 percent reporting label attributes like “organic” or “all natural” have little to no influence on their purchasing decisions, shows Iowa grocery shoppers may be growing numb to the product packaging in their cart. 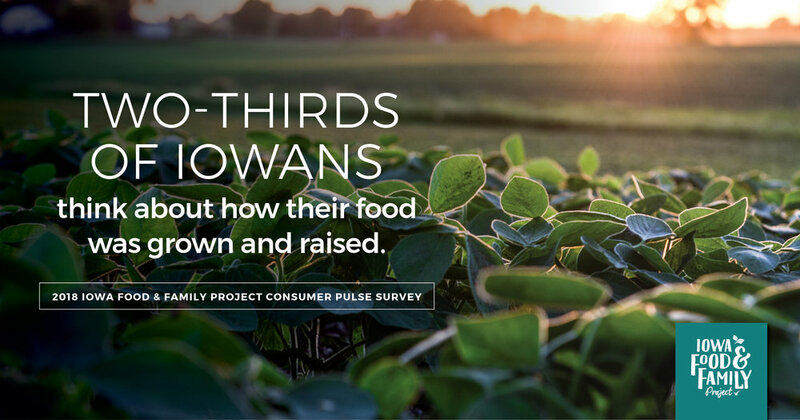 Now in its seventh year, the annual survey takes pulse of Iowans’ food purchasing habits, including label influence and attitudes toward farming. Year-over-year findings help shape Iowa FFP’s programming and content development. The November 2018 survey had 676 responses — the most in the survey’s history — 295 were engaged with Iowa FFP as monthly newsletter subscribers and 381 were non-subscribers. Respondents’ age groups, income levels, education levels and geographic regions closely follow the state’s population, resulting in a low margin of error of 3.79 percent. Blue Compass, a digital marketing agency in West Des Moines, conducted the survey analysis from data collected through Research Now’s business-to-consumer panel. Non-GMO labels appear on virtually everything from water to tomatoes to chicken. Oftentimes, there aren’t GMO counterparts to a product, so adding a non-GMO label is not only confusing but it’s also misleading. Food quality is the most important factor to Iowans when they’re grocery shopping with 58 percent rating it as “most important.” This was followed by price, nutritional value, ease of preparation, sustainability, where/how it was grown and raised, and compliance with diet, respectively. Among these influencers, price of food was the only factor to show an increase in “most important” ratings from 2017, up 4 percent. Even with the buzz around online shopping and meal delivery services, 95 percent of respondents indicate they primarily grocery shop in store. Hy-Vee continues to be the grocery store of choice for 42 percent of Iowans, followed by 21 percent choosing Fareway and 21 percent selecting Walmart/Sam’s Club. Market share for both Hy-Vee and Fareway is consistent with 2017 results, whereas Walmart had a 4 percent increase. Seven in 10 Iowans say they spend their free time cooking or baking. In looking at a typical week’s dinnertime habits, 86 percent prepare a meal from scratch, 54 percent prepare a pre-made meal (frozen, short cuts, leftovers) and 37 percent eat at a sit-down restaurant. To measure the thought Iowans put into their grocery shopping, they’re asked how strongly they agree with a series of statements. The survey found that more than half of Iowans think about how their food was grown and raised, 65 percent said they are knowledgeable about agriculture and 78 percent report being satisfied with Iowa agriculture. Iowa FFP subscribers were significantly more likely than non-subscribers to be “very satisfied” with Iowa agriculture, 47 versus 36 percent, respectively. The survey included a series of questions about farmer performance, asking if farmers are on the right or wrong track with water quality, caring what consumers think, building strong communities, animal housing, providing safe foods and biotechnology. Overall, respondents feel farmers are on the right track with those issues measured. Nine out of 10 believe farmers are on track with building strong communities and providing safe foods. Survey respondents were also asked to share opinions about where improvements can be made in food production. Thirty percent of respondents referenced water quality. While improvement is always needed, Miller says the finding underscores the need for farmers to be specific when talking about the progress being made to improve soil and water health. “As farmers, it’s on us to get out and share our stories. It makes a difference in consumer attitudes. We need to continue building two-way conversations between farmers and consumers and learn where the focus is when it comes to what consumers care about,” Miller says. Forty-four percent of Iowans reported being familiar with Iowa FFP, a nine percent increase from 2016. Ten percent reported being “very familiar” in 2018, an eight percent increase from 2016. The ag awareness initiative reaches nearly 120,000 followers each month through its newsletter, website and social media channels. This is roughly equivalent to the combined populations of Altoona, Cedar Falls and Dubuque. Iowa FFP invites Iowans to explore how food is grown around the state and meet the farmers who make it happen; 24/7, 365 days a year. Through these activities, it aims to empower consumers to make food choices based on facts – not fear. The initiative works with a collaborative network of more than 35 food, farming and healthy living organizations who are proud of Iowa’s homegrown foods and hometown values.